Here's the link. Please take the time to read it. A little background, way back when the Texas 200 was in its early times, a very simple class of boat called a "Puddleduck Racer" was created, and caught the imagination of a lot of small boat people. To describe it does not really do it justice, but its 8ft long, 4ft wide, a true "box" with the only curve being the fore and aft curve in the bottom. The rules started off as very simple, just the bottom 10 inches of the hull had to conform to a standard curve and you could do what you like with the rest, so there were some very imaginative interpretations of the concept. I designed one, at Sail Oklahoma I had a good time sailing Kiwi Duck that the Monies built . Fun little boats and much better sailers than you'd think. A group of "Puddleduckers" decided to have a try at completing the "Texas 200", thats not a race, although we all know that two sails within sight of each other makes a race no matter what people say, but its a 200 mile run up the coast of the Gulf of Mexico from near Corpus Christie down by the Mexico border to a spot near Magnolia Beach near Houston. It takes 5 days, days of extreme heat, high winds, sand and shallow water, narrow cuts, big ship traffic and camping on the shore along the way. You carry all of your stores and camping gear with you, remember that these are very small boats! Its arduous, hard work, and an 8ft plywood box is not what you'd normally pick for the event, but they all finished, and in good spirits at that. With cancer taking some of our friends, and threatening others, a group has got together to sail those plywood boxes up that hot and windy channel again, hoping to raise money for cancer research, hoping that their contribution will help to save lives. I wish them all the very very best, Sail safely guys, my thoughts are with you. SEI is progressing, I will be able to spend a couple of hours a day on her for the next week or so before other things get in the way again. Its clinic visit then and that will slow things for a few days. In spite of a very friendly and competent staff I really don’t look forward to those visits, but hey, it would be worse without. SEI! The frames are all up, I’m reminded that I need to put more permanent markings on the components when I epoxy coat them so I can get the levels and positioning right, I’ve had to remeasure the bow stem and mark it again but otherwise the frame has clicked together very well, looks fair and the boats shape is becoming apparent when viewed from ahead or astern. 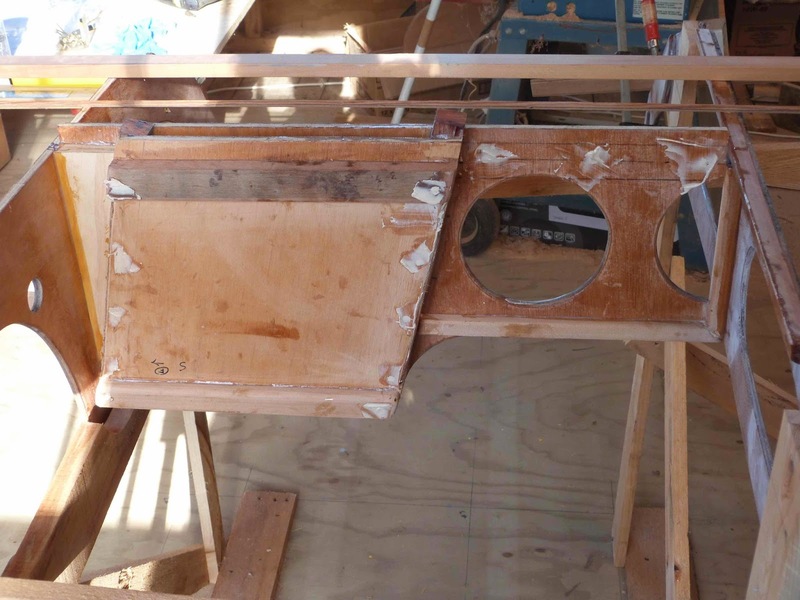 The daggerboard case is in place, that holds frames three and four together, one and two are positioned by slotting over the stem, six and seven over the stern stem and five is braced forward and aft to the sub assemblies ahead and behind it. As the bracing, (rather than good lumber I’m using pallets sliced up for all of the parts that will be surplus when the boats all done) goes on the assembly is becoming stiff and strong, it has to be able to stay exactly in place when I wrap plywood and stringers around it. The next stage from here is to put the seat riser ( support) stringers in place, that helps keep the frames in position as well as performing its seat edge job later on when the hull is upright and the interior being fitted. The light from the big windows is lovely to work in, and warm in our winter which is just beginning to cool off, but its not good for photography, you can see enough here I think to pick up how the boat is put together. Its an exciting time watching the shape take form. As mentioned before the Makita laser cross level has been a boon, I’ve usually used a string line, carpenters level and plumb bob and that does a good job, but the laser really speeds things up, so easy. As always I’m trying to use existing materials, cost is always a bother so I’m utilising some leftover material from other jobs. So those of you who are building SEI, ( off in the future ), when you see me do something a little different, please bear in mind that its sometimes “do as I say, not as I do”. In this case the end logs for the ‘case are as per plan dimension but are hardwood cut from the bearers on one of those pallets I mentioned in the blog a while back, and the seat riser stringers are leftover strips from a birdsmouth mast, they’ll be just a tiny bit undersize and I anticipate having to brace them across to keep them to a fair curve. This wont be the case if you use the size specified on the plan. The daggerboard case in place, I'd normally sand the filler covering the screw heads smooth before installing the component, but this will be easy to do if I get to it before the bottom panel goes on. Note that the 'case is long enough to fit right through the bottom panel and that panel sits on the "log" along the sides. I'll trim the excess off once the 9mm plywood bottom is in place. More on costs. Aussie designer Mik Storer has a deal going with some sailmakers he knows, and is having a small range of very nice balanced lugsails made at extremely attractive prices, these are available from him or from www.duckworksmagazine.com as well as directly through him in Aussie . The smaller of the two is very close in dimension to the sail plan I drew for SEI and I’m thinking that it would work well, so, like a lot of things I write about, “watch this space” for a sail test. A bit more on costs ( again) , one of my small boats recently cost its builder a staggering sum, I’d not long before built one to a pretty high standard of finish and fitout for just under 25% of his cost. Now I am pretty good at searching out bargains, know where I can save a buck or two, will make things that some people will have to buy so can trade time for money and have a heap of scrap in the corner of the shop which also saves a few dollars. In this case though the boat had all new fittings, rigging, sails and was on a brand new trailer so the comparison was very close to apples for apples. 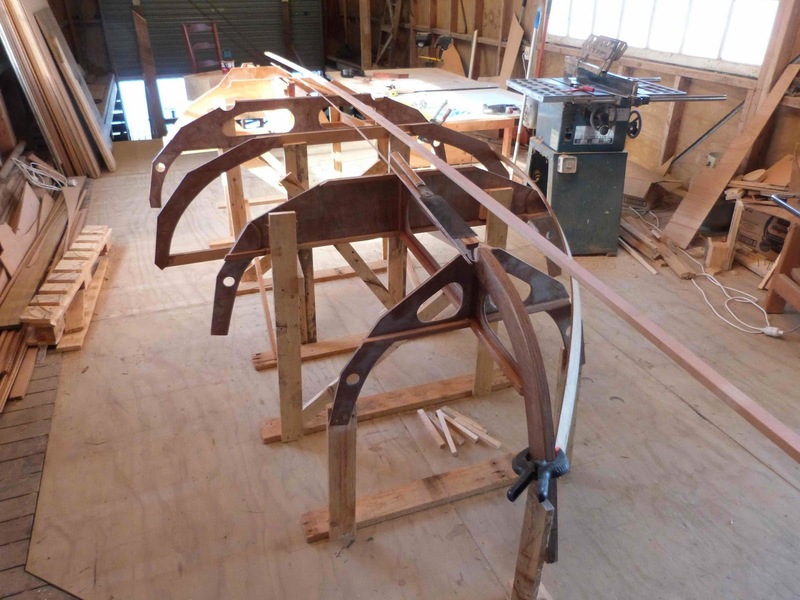 Its got me thinking about costs, and I think that the serial boatbuilders like me have a considerable advantage in that we quickly build up the knowledge about how to indulge ourselves in our passion without denting the household budget too much. Talking with friends about this, we’re thinking of working up an article on this subject. I’ve done some in the past and they’ve been posted on Duckworksmagazine but its past time I did it again. Back to SEI, The next step is to scarf up the bottom panel and fit it around the daggerboard case, then glue it in place. Here I'm checking that the framework is all "fair", that is that the plywood will wrap around with a nice even bend, no kinks or missing the fames. 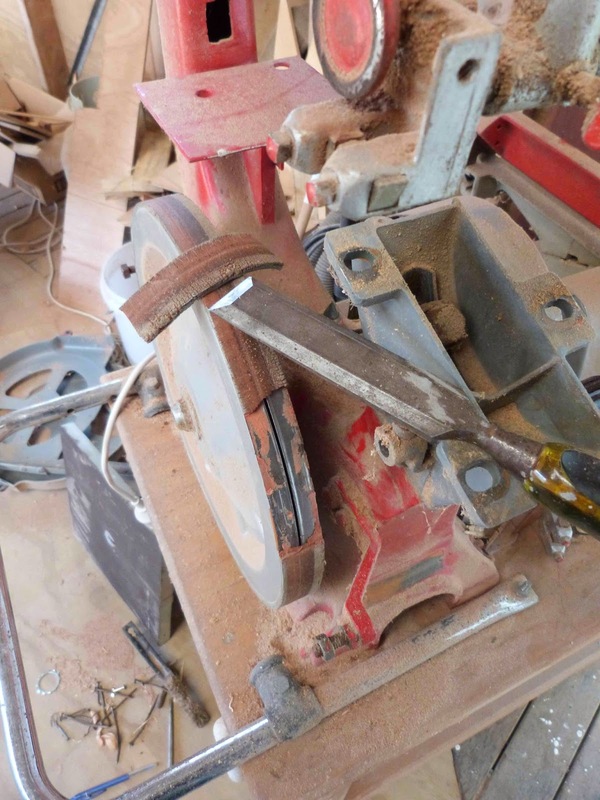 Thats my straight edge I'm using, but I"ll make a "spiling batten" when its time to work out the plank shapes. The plans will have those shapes already worked out, yes I know I could do it on a computer but I like doing things in "real time". Today, as soon as I’ve glued up this mornings bits and pieces I’m taking the ship out for a run down to the rivermouth and back, its been three weeks since the engine had a proper run under load and it’s a midday tide and I’ve spent some time out in the kayak at dead low tide to memorise the layout of the channels so I think that it’s a good opportunity to explore some with the bigger vessel and blow some of the cobwebs out. This years travel, two Wooden Boat Festivals and a Messabout! I wasn’t able to make it to the USA early this year, in fact I even missed out on some local events. But living on board the ship here on the river must be doing me good and I’m really looking forward to later this year when I’m off to SCAMP Camp in Port Townsend. For those who don’t know about this event, it’s a kit building class for SCAMPs, buy your kit, its delivered to the classroom, you come in on Monday to find the building jig all set up, the kit ready to go, an instructor to student ratio that means you’ve got lots of time with someone who can show you all the tricks and help you when you need. It is an exceptionally social event, family teams are encouraged as well as singles, the participants form long term relationships with instructors and other students, the event includes time out on the water in SCAMP #1 and the Small Craft Skills Academy is running sailing skills courses just before and just after that. Those skills courses are seriously good fun, involve classroom learning as well as on the water with instructors on board, and then time away overnighting to put it all into practice. For me, having attended several of both events they have become very special memories, as instructors Howard and I find that we make a considerable difference to peoples lives and it’s a wonderful thing to watch our new friends enjoying their new skills. Really rewarding stuff for us. After all that, it’s the Port Townsend Wooden Boat Festival which is an amazing celebration of wooden boats both classic and modern. Restorations, rebuilds, veterans, modern and new, professional and amateur, this event is a must do for anyone who loves boats. Its going to be on Sept 5 6 and 7 this year, and “here” is a link to a you tube video that shows you around the 2012 show, you’ll see the inside of the Maritime Center workshop where SCAMP Camp is held as well as a couple of partly built SCAMPs which went to the show after the SCAMP Camp. I’ll be there, again, wouldn’t miss it. But that’s not all, I’ll be home for a few weeks to catch up with things , then back on the big silver bird again heading for Sail Oklahoma on Lake Eufaula Oklahoma where Mike and Jackie Monies host what has to be one of the best small boat messabouts anywhere. I’ll be running a workshop course the day before the event, covering ( so to speak) the fiberglassing of plywood and associated skills such as taped seams, filleting, wet on wet glass cloth buildups, fairing and finishing fiberglass skin. Sponsored by www.duckworksmagazine.com this promises to be a really fun weekend. From there I’m off with Chuck Leinweber of Duckworksmagazine back to his house in Harper TX, then on a couple of days later to Port Aransas for the inaugural Port Aransas PlyWooden Boat Show. I’ll be running a course there as well, this one a two day one called “Essential Skills for the Beginner Boatbuilder. The course covers use of epoxy glues and coatings including fiberglass, sharpening and use of hand and power tools, setting up woodworking machinery including sawbench, bandsaw and jointer. 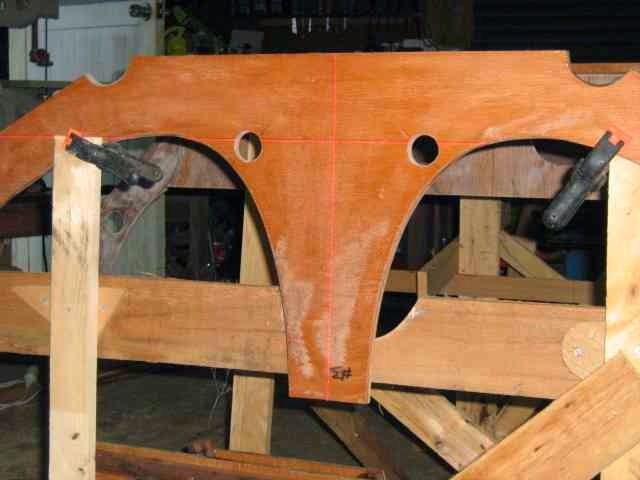 Scaling plans up to full size, drawing fair curves, scarfing plywood, making several joints common in plywood boatbuilding and a question time where you can get advice and often demonstrations about how to do things that puzzle you. Here’s the show website, not completed yet but the details on venue and dates etc are there. Oh yes, there will be SCAMPs there too. If you are a SCAMPer and live within driving range, do bring your boat. In fact, even if you haven't got a SCAMP, come along anyway. Just a thought, I fly back and forth from my home in New Zealand a lot, we Kiwis are the most isolated country in the world and flights across the Pacific can vary from 11 to 15 hours depending upon the start and finish points then I have to take more flights to get where I’m going. At the time it feels like the ordeal will never end, it does of course, eventually but it’s a cramped and uncomfortable experience every time. This time though I’m flying both ways on an Airbus A380 superjumbo, I’ve not been on one of those before. I’m looking forward to it. Hopefully I”ll see some of you at one of these events. One of the questions that I get asked by women whom I have just told that I live on board a boat, (that’s after asking “does it have a proper toilet?” and “ does it have a shower?” Yes to both actually) is “ I hope you are eating properly? That question comes up surprisingly often. Perhaps an indication of what some women think of a males ability to look after himself. Yes to that as well. On board I’ve a reasonable little LPG (gas) oven, with two burners on top. I’ve a proper fridge in which to keep fresh ingredients, in fact I’ve two refrigerators and two freezers. To explain, I’ve a small freezer up in the boatshed, and an under bench sized refrigerator on board. Both run on shore power, plus I have a ‘fridge and a freezer on boat that both run from a compressor on the engine. Those two are extremely well insulated, the fridge stays cool and goods stay frozen solid in the freezer for at least three days between engine runs so when we are away cruising we’re fine. Up in the boatshed I also have a small electric oven, a slow cooker and a microwave, that’s next to the freezer so I can defrost when I take something out. I like cooking, am not a gourmet cook by any means and cooking for one can be a real pain in the very low back, but I manage. My usual routine is to use the slow cooker to make a giant casserole (pot roast or stew) from beef or chicken about once a week, then freeze the result in one serving sized plastic pots. A beef stew for example, may be a shepherds pie from one portion, a curry the next, mixed with chilli beans the next, a pastry pie the next, and served with mashed potatoes and steamed veges the next. When there are three different meats, plus vegetable soup or lamb stir fry in that little freezer its easy to prepare something tasty and nourishing in just a few minutes. No lack of variety. I bake, scones, cookies, bread, do a mean chocolate cake when I know I’ve visitors coming, and make home made ice cream from time to time. (perhaps I should not have mentioned that last one , I’ll be overwhelmed with visitors, Oh well, could be worse) . Thats a breakfast plate, so not as much food as it appears. 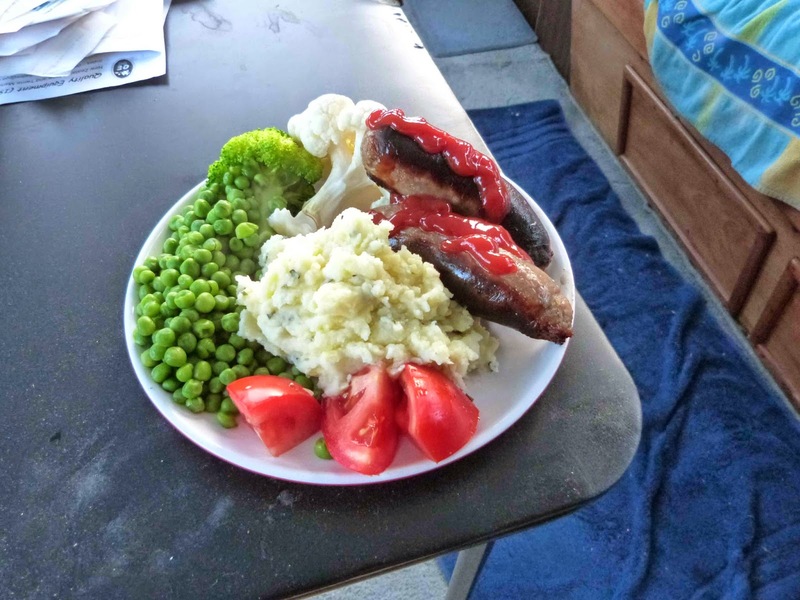 Still, lamb and herb sausages courtesy of our local butcher, mashed potatoes with cheese and chives, fresh tomatoes from a neighbours garden, cauliflower, broccoli and peas. Not too bad! I do stirfrys fairly often, chicken or pork and a heap of vegetables cooked up in a wok, just a smidgen of olive oil, a pinch of salt and a light sprinkle of oregano or chives. Nice, that only takes about 15 mins from “oh hell, look at the time, no wonder I’m hungry “ to tipping it out onto the plate and going up to the table in the wheelhouse where I usually eat. So I eat well, I might open a can of something perhaps every second week. Fresh fruit, vegetables and whole grain breads plus my little slow cooker meal portions work out well. I’m thinking of making a small herb garden in a big plastic pot, chives and parsley, spring onions, chervil and basil for starters. Its nice to be able to pick them just when they are needed. I’ve space up on the flying bridge. Its interesting how ones diet changes to suit the circumstances, I’m very fortunate in that my ship with its very well equipped galley did not need me to make a major change and my doctor, after getting me to keep a dietary diary for a month, approves. I've got a new toy. Makita SK102 Laser cross level. I’m setting up the frames for SEI. That’s usually a slow job with a level, stringlines and a plumb bob, but I’ve borrowed a carpenters laser level. This is about palm sized, comes in a nice little padded bag that looks a little like a camera bag, and has a padded wrapper around it inside to further protect it in what would usually be a very “robust” environment inside a house builders van. 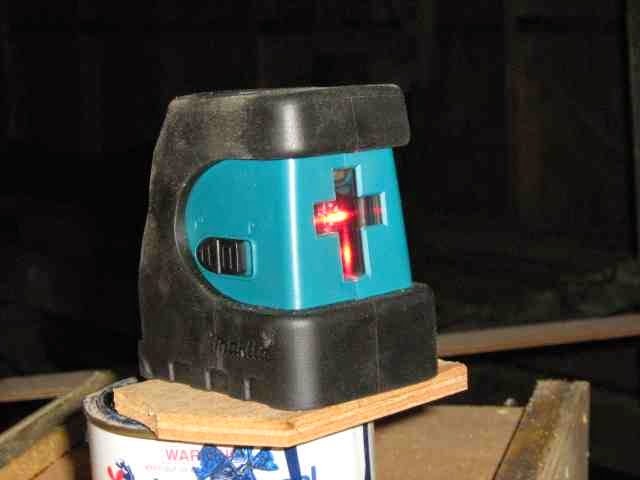 The Makita SK102 Laser cross level. To give you something by which to judge its scale thats a 500ml paint can its sitting on ( about a pint or so) . Is about 100mm ( 4 in) high. Runs on three AA sized drycells. To set up the boats frames, first of all I had to establish a straight base line, that was easy in this case as I’ve just laid a plywood floor and the line where the sheets meet made a perfect straight line. Next, measure out and mark the frame spacings using a carpenters roofing square to put lines across at right angles at the correct distances along that line. 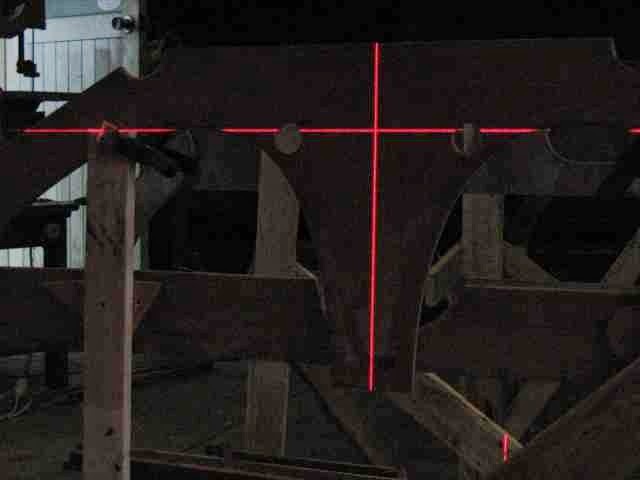 Then I set the laser level at the right height down past where the bow will be, and began lining the frames up. I’ve marked the frames with a vertical center line as well as the waterline across, so setting up is just a matter of getting the cross lasers vertical red line on the centreline, and lining the frame up on that, then rocking it until the waterline is congruent with the lasers cross line. Its hard to show just how clear the laser light line is, so I've taken one with the flash off ( top) and one with it on to show more clearly what I am doing. Its bright, the laser itself is about 3metres away in this pic, no problem at all seeing where the line is even on a bright day! Well, to be honest these things have not been around for very long, the LED laser technology is fairly new and the manufacturing tolerances very exacting, so in the past they were both very hungry on batteries, and more than a bit expensive. These cost about a days pay, and I think that the payback would be about two small boats in terms of hourly rate v/s time saved. To save me wittering on about it forever, here is a link to a YouTube video review of the little laser level which shows it in action. As a “by the way”. I see that some rental places have these or similar for hire, a days hire is a lot cheaper than having to own one for just one project. SEI is making progress, between another visit to the clinic with the usual two days to recover, looking after my wife who has been down with the flu which kept me away from the boatshed (its about 2 hours drive each way from her place to mine) and catching up with machinery repair work I’d not done much for a couple of weeks so its good to be back on the job and feeling up to making progress. 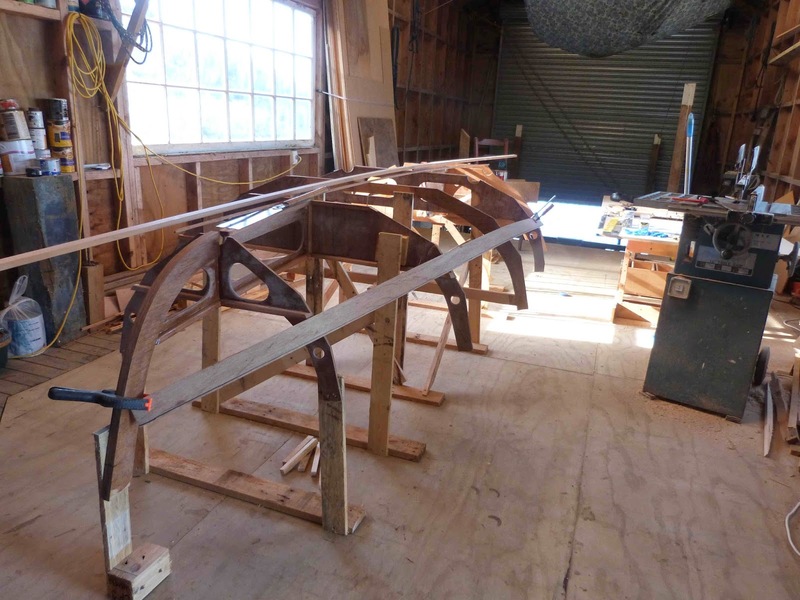 Watching the frames line up, and the shape appearing is great, one of the best parts of building a boat is that moment when you walk out to the end and sight along the framework and the shape of the hull magically appears. I hope to have the rest of the frames and the bow stem set up tomorrow morning so will put up some pics so show the progress so far. 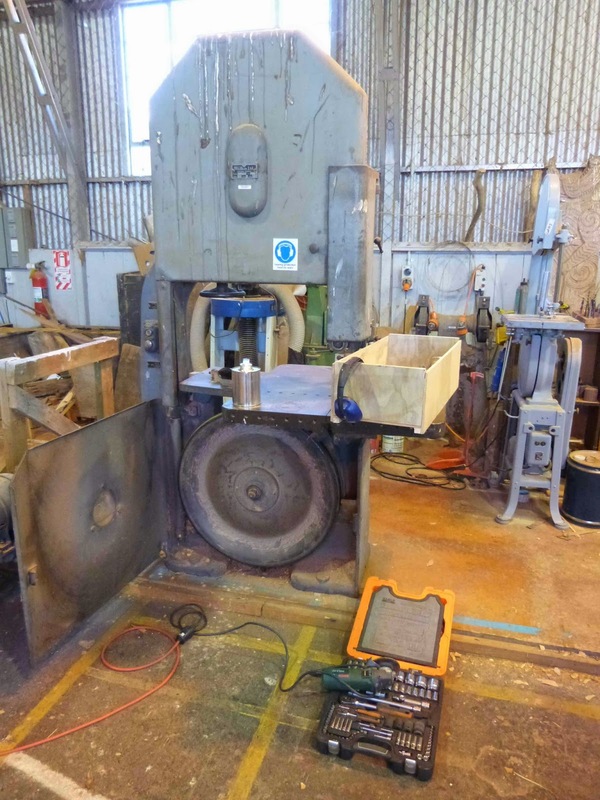 On the machinery repair work, I’ve done the job on the big bandsaw at the Maori Kings master carvers workshop, but no pics I’m afraid. Protocol requires that the work be finished and blessed before it is seen, so no cameras in the shop where these works are being created. But I know where two of them are to be erected, they will be the spiritual guardians of a new bridge to be built over the Waikato River and I can watch for that then get a pic or two. I’ve just looked into my cup and its somehow become empty, so its time to get back to work. Bandsaw tyres, fitting new ones. On fitting new tyres to the bandsaw wheels. Not mine, well I knew that mine needed some work when I bought it a few months ago, mainly new tyres and the guides refacing but its not really a problem. Just another job to be done. Just a word on when you need new tyres, they’ll do a lot of miles but after a few decades on a machine that’s doing a lot of work some tyres wear or compress in the middle where the blade runs. The result being that the machine starts to spit the blade off forwards, or the blade wont stay in the guides, it will tend to move forward or heaven forbid, if you make a blind cut and try to pull the work back toward yourself the machine will spit the blade off forwards at you. Whats doing this, is that bandsaws, with very few exceptions have crowned wheels. The middle of the tyre being “higher” is further around than the edges, the blade runs “up” to the highest point and will stay there as the wheel rotates, and when the tyre is worn to the point where it is hollow in the middle of course it runs up and out to the edges and off making a mess of the blade and your work. Time to fit new tyres. 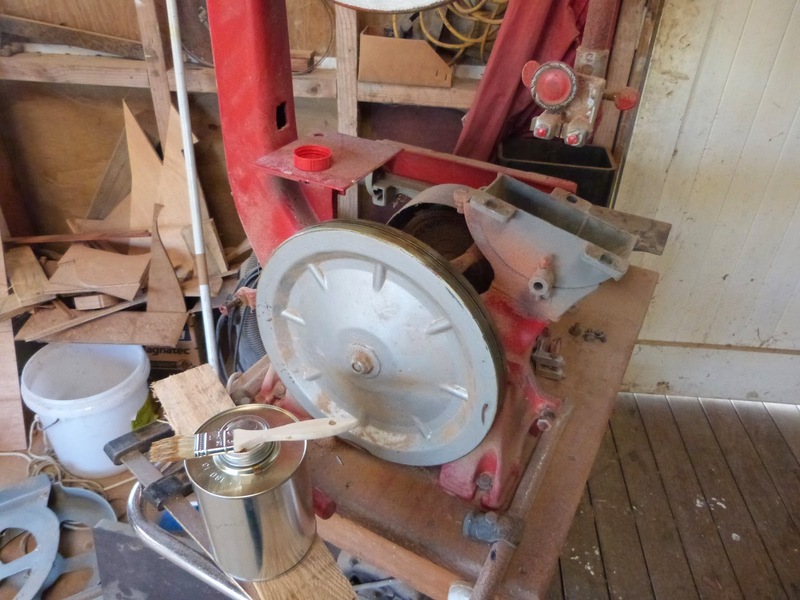 As part of my part time dayjob though right now I have a big old 1930s vintage bandsaw to get working properly. 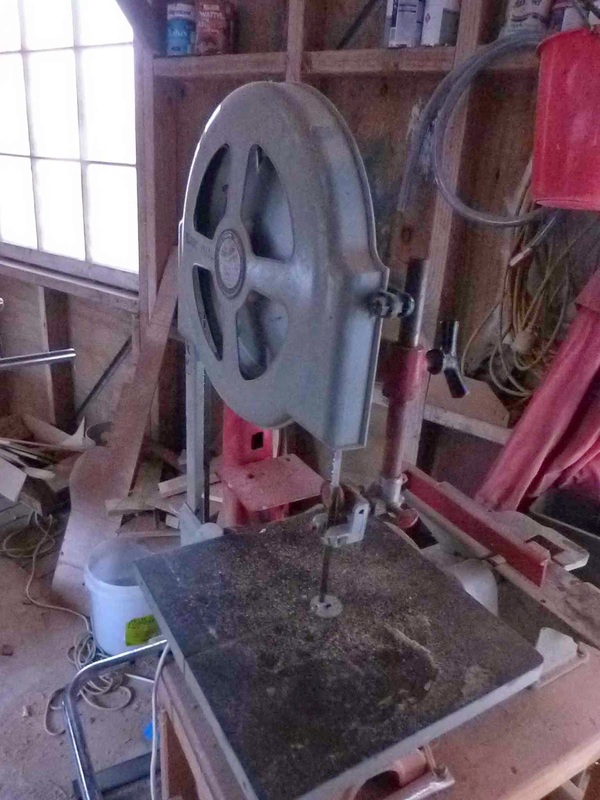 The machine is an English Wadkin 36in joinery shop bandsaw, 5 hp, 12in depth of cut, 36inch wheels and weighs in at around a ton and three quarters. Beautiful machine, stable, powerful and very well engineered. After all these years though there is some wear and tear, and it shed a tyre the other day, plus its guides are not the originals and not doing well. They’ve been replaced with blocks of UHMW plastic ( Ultra high molecular weight ) which tends to heat up and wear very rapidly. Not good. I’ll talk about these in another post. 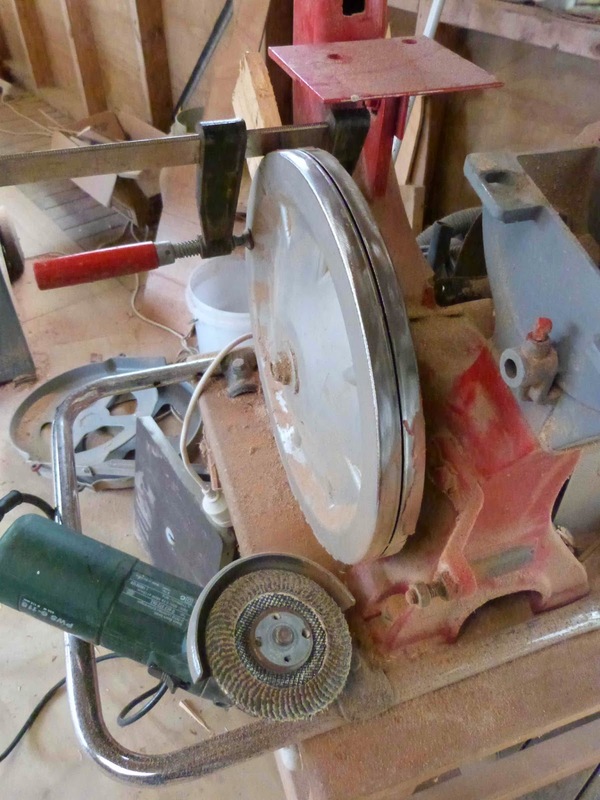 This machine is in the workshop of King Tuhetia’s master carver. Its a magical place where wonderful traditional Maori carvings are being chiselled out of huge logs and slabs of wood. I’ll see if I can get some pics, but in the meantime I am part way through replacing the tyres on the big machine, and did my own little 1950s vintage 12in Walker Turner as a practice run while I had the primers and adhesives on hand. The big 36in Wadkin at the Master carvers workshop, this will take blades from 1/4in wide to 2in wide, cut up to 12in deep, and with the right blade will go through 4in wood at walking pace. 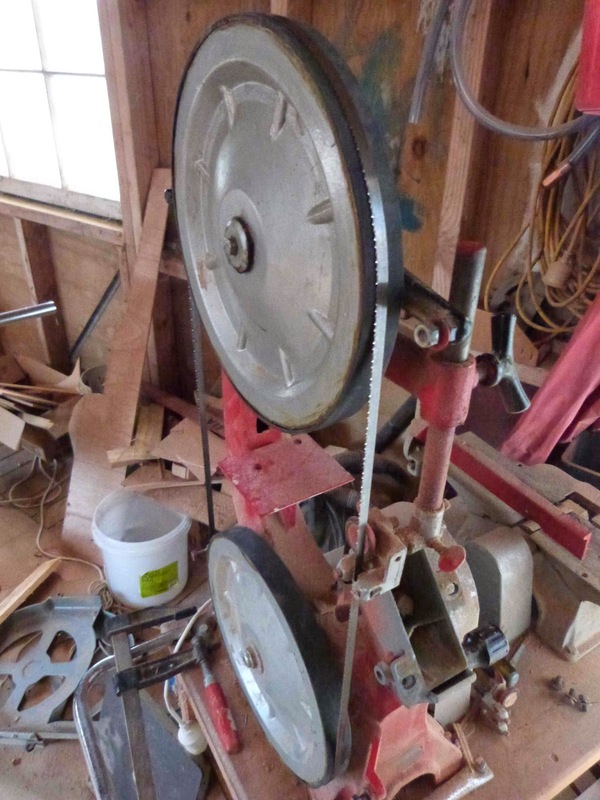 Scroll work to mini sawmill, its a wonderful machine. Some advice on getting tyres for your bandsaw. Trying to obtain genuine spares for a 1950s machine where the manufacturer is no longer in business, let alone a 1930s built machine is never going to work, so for these I went to a company who supply conveyor belting, and have all the materials and technology to make rubber and polyurethane belting to width and length from blank stock. There will be someone doing similar work in any area that has a reasonable sized manufacturing base, let your fingers do the walking through the Yellow Pages and you’ll find them. Kerrin at HCD made up my new tyres for both machines, they’re not cheap, but then the machine wont run without them. From their range of product I chose a 60 shore (a measure of compressibility of rubber or similar) polyurethane, and specified the thickness of the tyre from their range of sheet material. I chose material in both cases that was just a fraction thicker than the original as they did not have an exact match. Be aware that you need to be as close as you can to the original but not under, too thick and you’ll have problems plus your blades could then be too short. You need to be very accurate with this. You need your tyre to be slightly shorter than the circumference of the wheel, if not under tension it can bulge up and cause a bump bump as the wheel rotates the bulge past the blade. If I’m using rubber, for a tyre that’s say 3mm thick I’ll use a figure for its length of circumference minus 6% but for thicker materials I’ll go to 4%. I use 3% in all cases for polyurethane. If your machine has a shouldered wheel, that is a lip on each edge, more common on metal cutting machines than woodworking but it is known, the tyre needs to be maybe half a mm narrower than the distance between the inner edges of the lips, if its too wide, even the slightest amount, the tyre may bulge up at the edge which ruins the tracking. HCD also supplied me with the specialist adhesive and primer for the job, you don’t need a lot of it and its not cheap. But again, if you have a machine that wont work otherwise, you don’t really have a choice. Buying it in a small quantity from HCD meant that I did not have to spring for a full 500ml can of each so that helped the cost a lot. Having got this far, you’ll be sitting looking at the machine with its guards and doors open, wondering where to go next. First, you don’t need to take the wheels off, but it pays to take the table and the guides off for access. Find a way of stopping the wheels from rotating, a stick through the spokes might do it, or a helper holding them, there wont be much stress on the wheel it just needs to be held still while you work on it. Strip the old tyre, a very sharp chisel will do this ( mind your helpers hands) , cut across the tyre, use the chisel to peel up the end enough to get a grip and pull letting the wheel rotate toward you as you pull. It will probably come off in chunks leaving bits on the wheel perimeter, no big deal, persevere until you have the bulk of it off. Stripping the old tyre from the bottom wheel of my 12in Walker Turner machine, you cant see it from this angle but I've clamped a piece of wood to the back side of the wheel to keep it from rotating while I work on it. Next, all traces of the old tyre and the adhesive must come off. I use a little 100mm angle grinder with a Norton flat abrasive flap disk on it. Wear safety glasses, these things are designed to shed little particles of abrasive as they wear and that stuff is very serious if you get it in your eyes. This disc will clean off any chunks of the old tyre as well as the old adhesive, it leaves a polished surface but try not to remove any significant amount of metal. Especially important on aluminium wheels as these discs can remove metal quite quickly. Cleaning off the rim with an angle grinder fitted with a Norton abrasive flap disc. All traces of old rubber tyre and the original adhesives have to be cleaned off as with any trace of oil or such. When perfectly clean, wipe with a solvent that leaves no residue, I use MEKP but Acetone or even methylated spirits ( alcohol ) will do. No trace of oil or any such to remain. Try your tyre by dry fitting, remember the allowance for stretch. It should be like putting a big rubber band around a parcel in that you have to stretch it on. Paint a very thin film of the adhesive primer onto the rim of the wheel. Make sure that the film is very even, brush across then along. You don’t have much open time on this stuff so work quickly. LEAVE NO LUMPS. Same will apply when putting the adhesive on. I use chip brushes by the way, throw them away afterwards. Leave to cure for 2 hours minimum on a warm day, overnight if cool. Apply a second coat. Note, where you have “joined” as you work around will leave a small area where the film is doubled up, make sure that you don’t “join” in the same place with the second coat. Coat the rim with the adhesive, this is a very powerful contact adhesive and you only get one chance so read carefully here. Applying the primer for the two stage adhesive system. Have the tyre inside out, and coat with the adhesive. Hang up on a nail or such and leave to dry for the time that the manufacturers ( I use a Bostick system) specify. Note, if you put the coated tyre down on its edge on a wooden bench, you may have a real problem when you come back and find that its stuck to the bench! If you’ve not done this before, a helper will be very helpful. So to speak. Wash your hands very thoroughly to remove your natural oils, and no do NOT use rubber or fabric gloves for this job, they’ll become a permanent part of the tyre. You can touch this adhesive and not get stuck, it should be tack free (not sticky to the touch) at this stage, but will seriously stick to the primed and precoated wheel. Flip the tyre back the right way with the glue inside. Place the tyre on the far side of the wheel rim for about 20% of the circumference. It pays to work over the top of the wheel and toward you. Making sure that the part of the tyre in contact with the wheel is properly lined up relative to the wheel edge, rub it firmly to apply pressure to the adhesive in that area. Get your helper to hold the wheel while you take the tyre and stretch it by pulling it toward you, I do this in about 5 or 6 stages, pull, line up, put on with the pull still on, and rub to pressure the adhesive. The idea here is to spread the “stretch” that I mentioned earlier fairly evenly around the perimeter of the wheel. If you don’t, you will have to put all of the “stretch” into the last little bit as you apply it and that’s not easy, plus the tyre will be unevenly tensioned and that may cause problems. New tyres on, tracking the blade back and forth with light pressure on to "settle" the new tyres onto the adhesive. Work around the wheel until the last bit, I find that last bit is easiest by twisting it so the near edge is in contact with the near edge of the rim, and rolling it on. Note that this adhesive does not really grab hard until it has pressure on it so you do have a little ability to shuffle it. Not much though, don’t count on it, try and get it right first time. It may pay to practice the process “dry” a couple of times. Leave it for a day, then put a blade on with low tension, run the machine using the machines tracking adjustment to move the blade back and forth on the wheels to apply even pressure over the whole tyre. Do this for maybe 10 mins or so. Ready for another 50 years. Leave for a day, and you’re rolling. The answer is 500mm, thats about 20 inches. I'll be be back in a day or, two, am working on fixing a monster bandsaw which has shed the tyre off its lower wheel and am taking my wife and the 5 yr old granddaughter to the zoo.